Why Choose Gendler Dental Center in Hopkins, Minnesota? Finding a new dentist to meet your specific and individual needs can seem a challenge. Not all dental centers in Hopkins, MN provide the same level of service or dedication to patient care and comfort. Gendler Dental Center has carefully cultivated and grown its “dental culture.” We believe we will be the right fit for your family’s dental healthcare needs. Visiting your dentist shouldn’t be stressful. You also shouldn’t have to travel all over the city to other dental practices or specialty practices to receive the comprehensive dental care you need. At Gendler Dental Center, you’ll find a convenient, centrally-located office. Our practice is your one stop for comprehensive, general, implant, cosmetic, and restorative dentistry. Make one phone call to schedule your visit. You will have your dental care needs addressed at one location, and we strive to make your every visit a fantastic experience! The dentists at Gendler Dental Care are dedicated to the dental care of their patients. They are also dedicated to the profession of dentistry. Our team of doctors has the experience, skill, and advanced dental training to deliver top notch care. Dr. Gendler is a Diplomate of the American Board of Implant Dentistry. What does this mean to our patients? It means that Dr. Gendler has achieved the highest level of competency in the field of Implant Dentistry. Only 400 dentists worldwide and only FOUR in Minnesota have attained this status. By providing full-service dentistry in one location, we save you time and ensure you receive the care you need and the smile you deserve. Our practice mission: We have built our Hopkins, MN dental practice on the tenets of honesty, integrity, and respect. You will always receive our undivided attention and personalized care focused on your unique needs. Gendler Dental Care and its office is spacious, warm, and inviting. You will feel welcomed and safe from the moment you call our office to make an appointment to the time you walk through the door. Because we are dedicated to our patient’s dental health, we have invested in the latest technology and equipment to assure you receive comfortable, dependable dental care. For example, our fully digital office utilizes digital radiography that emits 90% less radiation than traditional X-rays. Because we want our patients to thoroughly understand their treatment plan, we use intraoral cameras to take images inside your mouth. The reason we do is, is we can then display them along with your X-rays when you’re in the dental chair. This aids us in providing an accurate and comprehensive diagnosis. The intraoral camera and images also provides your dental care provider with a better view and understanding of your unique dental treatment needs. The digital radiography also enhances the communication between our doctors and laboratory technicians. What does this mean to you? It means we can provide better dental care and service that lead to more predictable results for our patients. The investment our dental practice made in its own CT scanner gives us ultimate precision when placing implants and this is key to successful outcomes. Cone Beam or CAT scan technology allows us to create a 3-D replica of the anatomy of your head and neck in a 1:1 ratio. This data assists our team in evaluating implant placement and restoration options, discovering pathologies, planning orthodontic procedures, aiding in extractions, and analyzing airway capacity. Currently, there are only a few hundred I-CATs in the world, only a few in the state of Minnesota and one in the Gendler Dental Care office. Technology is great, BUT we understand it is the personal touch that goes further in making your dental experience a pleasant one. It’s the personal touch that makes you feel good about your smile and your choices for dental care. We value our patients and that means we value their time. Because we understand that time is of the essence to our patients, we are one of a handful of dental offices that has a full service laboratory on site. What does this mean for you? It provides unmatched convenience for our patients. In many traditional dental offices, a patient will have to wait to receive crowns or dentures. At Gendler Dental Care we eliminate wait times, reduce the potential for additional appointments, and many other dental care procedures can be addressed on site, saving you valuable time, lessening your discomfort and saving you money. We understand that, for many, dental care visits cause fear and anxiety — usually based on prior dental experiences. We appreciate and understand that and that’s why our dental practices specializes in relaxation/sedation dentistry. We have made it our mission to work with dental phobic patients and help put them at ease. 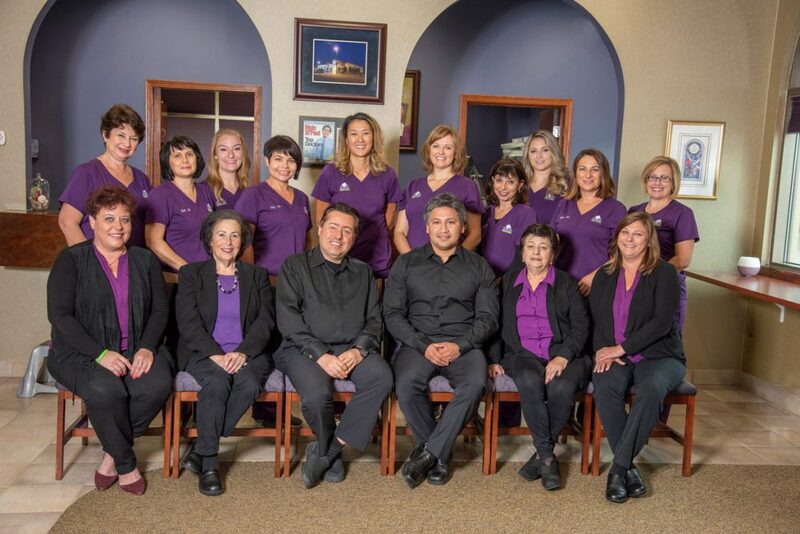 Our team caters to the needs of our patients and we strive to deliver your dental care in a safe, comfortable environment, and as pain-free as possible. Our stress-free dental care experience includes offering a relaxing spa-type atmosphere, soothing music, and the latest movies for your enjoyment. Most important to our patients is the gentle touch practiced by our dentists and dental hygienists. As if all of this wasn’t enough we do know that a relaxing atmosphere and caring attitude aren’t enough to allay our patients dental fears. To alleviate the fear, anxiety and pain for our high-fear, low-pain-threshold patients we provide a full range of sedation dentistry. Proven sedation dentistry methods will help alleviate fear and help you face dental visits with confidence. Dental phobia is nothing to be ashamed of (and you’re not alone in that fear). Talk to us. We can help. We care about our patients and every level of dental care we deliver. We take our responsibilities to your dental health and your comfort seriously, but we like to have fun too. Our office staff provides a lighthearted atmosphere that we think you’ll enjoy! We practice the “Golden Rule” dentistry meaning we will treat you the way we’d want to be treated. Our team loves working together, and it shows. We band together to deliver an unsurpassed level of service and care. The drawback? Be prepared to hear a corny joke or two! Excellent dental care involves more than clinical skill and high-tech tools (although we pride ourselves on providing that). A good experience for both the doctor and the patient is one in which the lines of communication remain open. We want to get to know you and truly understand your needs and concerns. That’s the way we do business, and we are in the business of building lasting relationships with our patients. We want to provide you and your family with the type of dental care that we would demand for ourselves and our families. You lead a busy life. Making time for dental care is a smart choice, but we know you’ve got other things to do. We do our best to see you on time, efficiently address your issues, and get you back to your day. We’ll give you our time by answering your questions and explaining your options, and then working with you to make dental care decisions you can feel good about. At Gendler Dental Care, we’re not happy unless you are. It’s that simple. Your complete satisfaction is what we work for every day. Exceeding expectations is a way of life for the team at Gendler Dental Center. We guarantee our work and stand behind everything we do. Discover the difference! At Gendler Dental Center we strive to make your dental treatment easy and affordable. We also know that not all dental treatments fall into the “affordable” range. We do know, though that caring for your smile and your overall dental health is one of the best investments you can make in yourself and your health. Our dental staff will work with you to find a financing plan that fits your dental needs and your budget. Your treatment is a valuable investment in your health and well-being. Call our office today to schedule your appointment. COPYRIGHT GENDLER DENTAL CENTER. ALL RIGHTS RESERVED. How Do We Make Implants So Affordable? How does the sedation process work? What type of sedation is best for me? Who will perform my sedation? Dental Implants vs General Dentistry?